Janek Simon (www.jansi.art.pl) is an up and coming young Polish artist who will exhibit his interactive installation ‘Carpet Invaders’, a redesigned version of the Space Invaders video game. 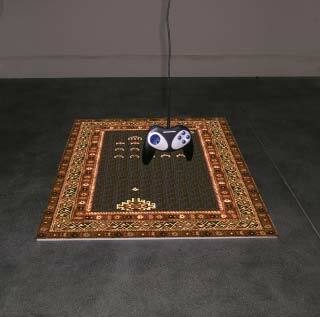 He intercalates two ‘opponent’ cultures; the computer game representing the capitalist leisure industry mixed together with traditional motifs of a 19th Century Caucasian prayer rug. Carpet Invaders is an interactive instalation. 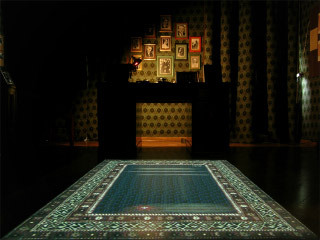 A computer game is projected onto the floor. The game’s graphic is taken from a 19th century caucassian prayer rug. The game is a clone of an early arcade classic - Space Invaders. Ornaments found on the rug turned out to be almost identical as the orginal graphics of the game. The game can be played with a gamepad hanging next to the projection The sound resembles that of early consoles and eight bit computers. "An Eastern prayer rug 'lies on the floor'. As opposed to real prayer rugs, its design is not fixed. Using a gamepad, the beholder can fight against the rug by attacking parts of its design. Those who manage to destroy them all go on to a higher level. Playing this game could prompt reflection; this is, after all, a new battle against a rug whose design was once full of significances that have, in the meantime, been suppressed and degraded to the role of decoration. In a perverse way, the game restores life to this ornamentation by turning it into a hostile being that must be destroyed in combat."